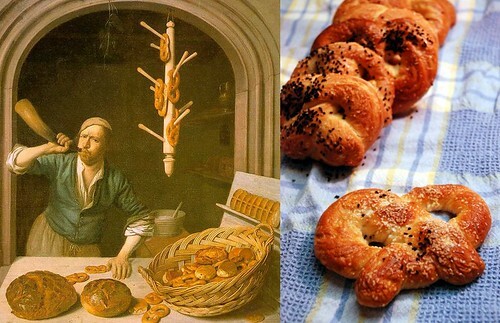 Pretzels, near ubiquitous in Dutch paintings, were another sort of given for the dinner party. Maybelle’s Dad required them on the menu. And, while I picture tiny handmade soft pretzels to hold the name tags, he decided to create larger more rustic ones. And, his suggestion was a good one. They went over so well, tiny ones would have been cruel, cruel indeed. These pretzels look so perfect and enticing! 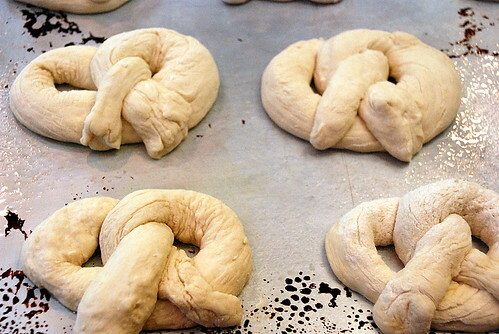 I'm thrilled that you ended up using my pretzel recipe! They are art! Absolutely lovely. Why is that guy blowing a horn while making pretzels? I don't get it.